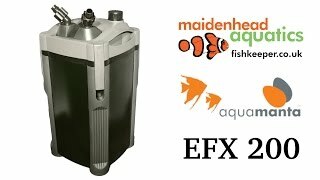 Maidenhead Aquatics are delighted to bring you yet another exclusive product- the AquaManta EFX External Filter. Maidenhead Aquatics are delighted to bring you yet another exclusive product- the AquaManta EFX External Filter. Available in 200, 300, 400 and 600. 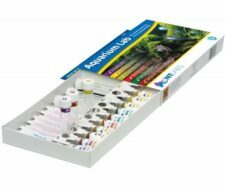 The combination of multiple media’s ensures the balance of mechanical, chemical and biological processes ensure healthy water conditions in your aquarium. 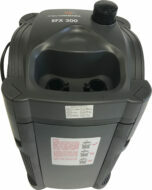 Water enters the filter and is pumped to the base of the canister filter where it is evenly distributed across the base. From there it flows upwards firstly through the 15ppi Course Foam to extract the larger particles. 2nd phase is the Activated Carbon Module which traps the finer particles, helps remove dissolved organic matter. Carbon also removes chloramines, Chlorine, heavy metals as well as helping to maintain clear water by removing ‘dyes’ from the water. Water then passes to the Advanced Biological Media which is where most of the transformation of ammonia and nitrites will take place through specific bacteria that will colonise on the extremely porous surface of this excellent media. In the final chamber of the filter the water first travels through a Medium Foam that provides additional biological filtration properties. The Phosphate Removal Pad removes unwanted phosphates from the water helping to eliminate algae and slime growth in the aquarium. 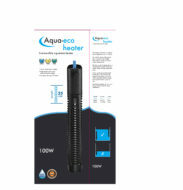 It improves water quality and reduces maintenance requirements. 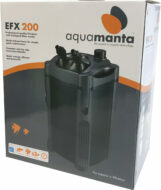 Finally the White Wool Filter Pad removes microscopic particles and polished the water before it returns to the aquarium. The integrated Quick Release Tap System means mess free, fast and simple removal of the filter unit for your regular maintenance. Please contact your local store for availability.